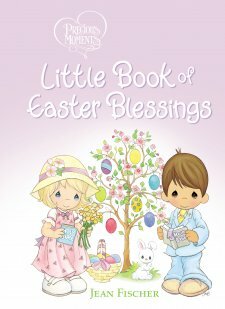 The Precious Moments Little Book of Easter Blessings is a beautifully illustrated board book filled with poems, bible verses and the timeless Precious Moments boys and girls. Every other page has a bible verse from the International Children’s Bible. The poetry of this book presents information about the events leading up to Jesus’ crucifixion and the Resurrection. There are also several poems that speak of springtime, eggs and bunnies. In fact the cover of the book shows a little boy and girl holding their bibles and standing before a blooming Dogwood tree adorned with colorful eggs and the very first poem is titled “An Easter Egg Hunt”. The author makes an effort to integrate the elements of egg hunts and chocolate bunnies into biblical concepts. The poem “An Easter Egg Hunt” is followed by Jeremiah 29:13 which speaks of searching for God and the promise that He can always be found. In a similar fashion, “Chocolate Easter Bunny” is followed by Matthew 7:11, “Your heavenly Father will give good things to those who ask him” and few would argue that a chocolate bunny is good to eat. I find it difficult to rate a book that is so beautiful and includes God’s word and pictures of children in prayer as well as the more worldly aspects of the holiest of holidays. In fact it’s a difficult balance that goes far beyond a book review. I’m going to rate this with 4 stars in acknowledgement of the innocent illustrations and the beautiful presentation of springtime and Easter celebrations. Thomas Nelson, the publisher of Precious Moments Little Book of Easter Blessings supplied a copy of this book in exchange for an impartial review.